Applying liquid eyeliner is a skill best suited for those with steady hands, not a skill that I possess. So what’s a beauty girl to do when the hottest Fall 2011 trend is the seductive cat-eye look? Enter the new Dior Backstage Eyeliners-To-Wear Multi-Wear Adhesive Eyeliner Patches. These eyeliner “patches” were carefully crafted by Dior makeup artists and were designed to transfer like a temporary tattoo. The designs range from matte-black to the more decadent, lacquered finish with sparkling Swarovski crystals. Apply Eyeliners-to-Wear to dry, makeup-free skin. Gently remove the eyeliner patch from the silicone backing. Place the patch on the curve of the eyelid, pressing lightly to ensure perfect adhesion. For optimal hold, apply the glue to the back of the eyeliner patches with the foam tip before use. Then, place the patches on the curve of the eyelid. To remove the patch, simply lift it delicately from the eyelid while holding the outer corner of the eye in place. After use, return the patch to the silicone backing to store the patch and to maintain its adhesive properties. 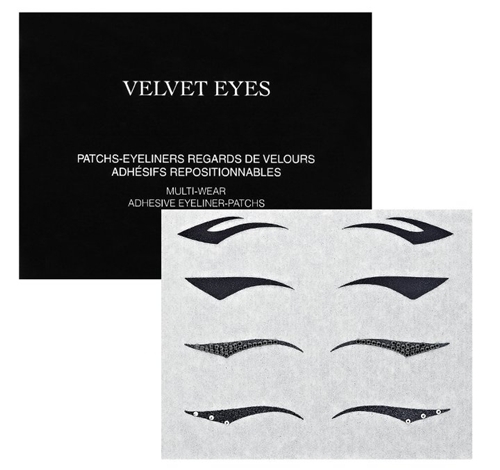 These eyeliner patches are exclusively available Beauty Insiders at Sephora and Sephora.com. Will you be picking up a set? I was intrigued when I first heard about this, because I have watery eyes and winged liner always smudges on me. But after reading the directions I’m just a bit disappointed. What’s the point? Either the patches won’t stick/won’t be reusable if I apply my primer and shadow before attaching them or I get them grubby and covered in primer and shadow if I apply it after sticking the liner on?